Thenkuzhal is one of my favorite Muruku varities. 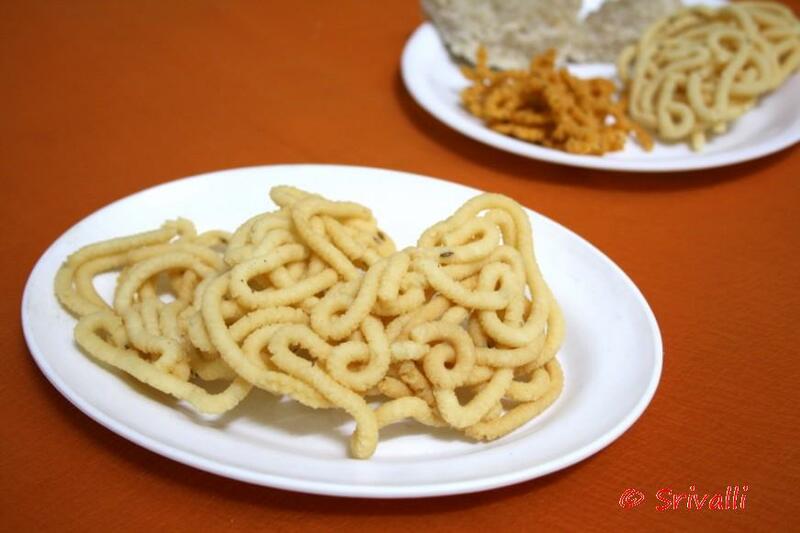 This Diwali we wanted to make Thenkuzhal along with few other muruku varieties. Sweets will follow tomorrow. I always enjoyed eating this Thenkuzhal and was surprised to find that the proportion that Amma normally uses is almost the same except of course you add some and minus some! 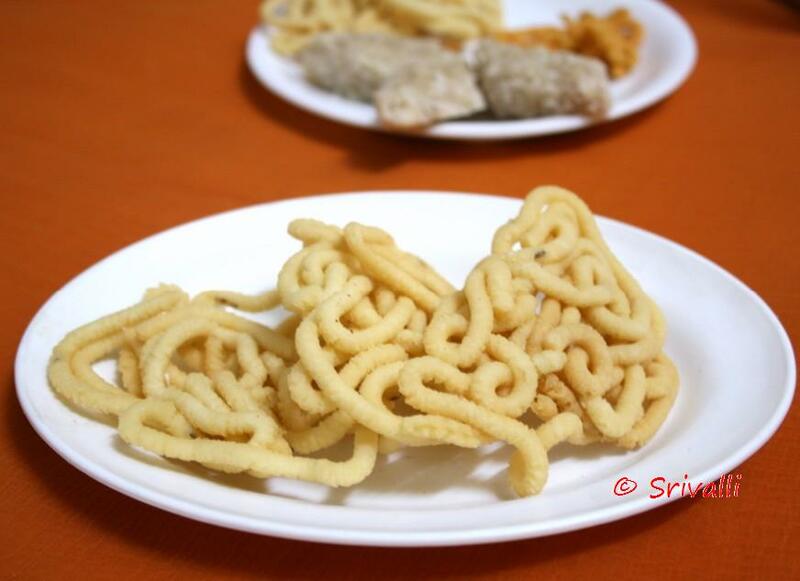 For making the murukus, follow the exact same method as seen in the Jantikalu or Muruku. I am going to list out only the ingredient proportion as the making method is the same. Before I forget, I had a wow moment this evening. While browsing through our cookbook collection, I happened to look into those old books I remember Sree buying. We always made sure to visit the annual Madras Book Fair. And every year, we used to add some to our collection. While I used to buy Tintin and Asterisk, Sree used to buy different genre, at times it also used to be cookery books for Amma. So one such collection, especially when he thought he might have to teach himself to cook, he had got some set of collection. Until this evening, I never realized it was “Meenakshi Ammal Samaithu Paar”. As it was called Cook and See, it never struck me to translate. How fantastic! I was jubilant. Imagine having heard so much about this author and always had her collection. Deepavali has always been special for the times I spent with my brother, planning on how early we should get up for the firecrackers. Its been years since we actually did it. But every year I never fail to remember our childhood days, every year it used to be the same. It makes it all so nostalgic, I miss my brother. Diwali is not as special if one doesn’t not remember the good days spent as a child with siblings. I am sure he is making the festival a grand remembrance for my niece and nephew as we are making it for our kids. And it was one of the reason why even when Peddu is down with fever, we want to make sure others don’t feel let out. And this festival of lights will surely brighten him. Wanted to share the first batch that was done today. 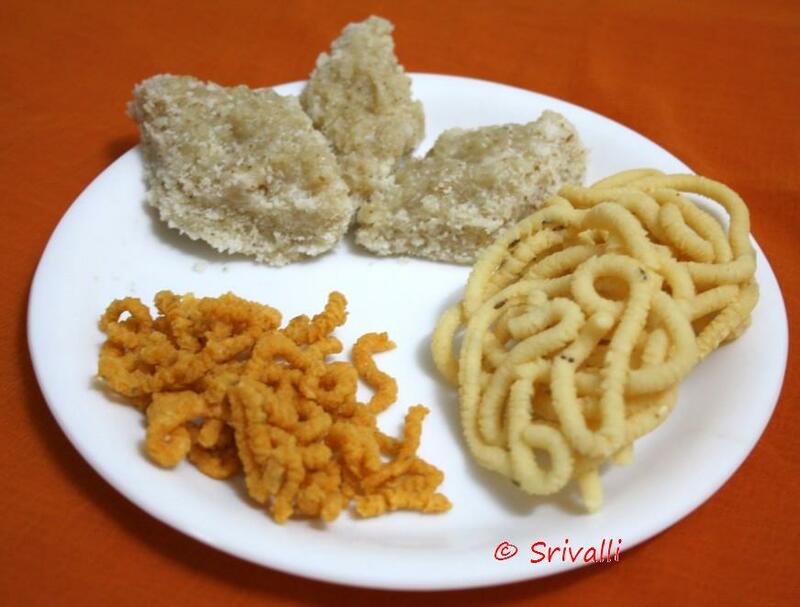 Made Thenkuzhal, Buttermilk Muruku and Amma made Coconut Burfi. This normally stays good for weeks. nice…looks lovely and missing it!!…. Looks yummy and crunchy Sri! happy Diwali to you and your family! Yummy!! The muruku looks very nice!! Wish u Happy Diwali to u and ur family Valli! Crunchy murruku! Can you send some thenkuzhal over please?